Tall men may have a bit of a challenge in finding a comfortable, well-fitted bike. No matter what type of bike you're in the market for, whether a road, mountain, touring or cyclocross bike, most manufacturers cater to the most common heights of men, from around 5 feet 10 inches to 6 feet. 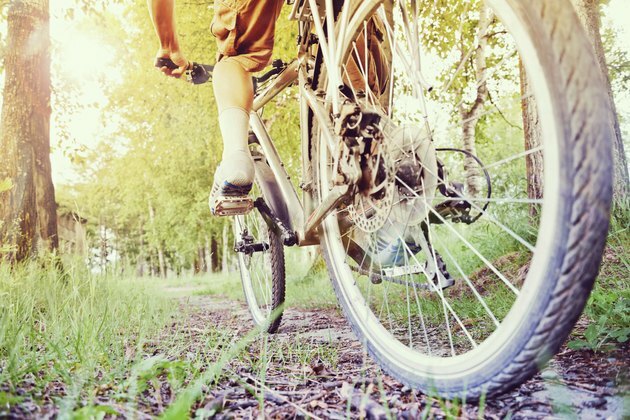 Although there is no single "best" bike or bicycle manufacturer for tall men, seeking out certain features will help you find the best one for your needs. The most important size aspect of a bike frame is the top tube length. Most other elements, such as the seat post and stem, can be swapped out to create a perfect fit, but if the top tube doesn't properly measured against your torso length, there's no way to adjust it. Sizes vary based on the geometry of a frame. For example, a 61-centimeter bike with no slope is not the same as a 61 cm bike with a sloping top tube. Because frame size is mainly based on the length of your torso, not your height, have a bike fit specialist help you determine your correct size. If your reach is a little longer than your handlebars currently allow, you can trade out the stem for a longer one. Stems come in 1 cm increments, typically from 7 to 14 cm. They also come in varying rises. A common problem for extremely tall cyclists is handlebars that are too low. Although you can add spacers to increase this height, you can also bring your handlebars up with an angled stem. The best bike for tall men will already have a long, angled stem. The material that a bike frame is made of is another important consideration for taller-than-average men because they tend to be heavier than petite or average-height riders. For riders heavier than 170 pounds, frame material is more important. For example, carbon and aluminum frames will break down more quickly from heavier riders than a frame made of steel or titanium. The best lightweight option that's both durable and comfortable for tall riders is titanium, but it is expensive. If titanium isn't within your budget, consider a steel frame. Because steel is heavy, a frame that's made of both steel and carbon can be another smart choice that's a little lighter. Off the shelf, most manufacturers produce frames that will fit men who are a taller 6 feet, but beyond that, you may need to consider having a custom bike frame built. Although this is an expensive option, it's much better than purchasing a bike that you can't ride or that's uncomfortable. If you have a custom frame built, consider choosing titanium frame material, as this will provide you with a frame that will last a lifetime. What Size Person Will an 18-Inch Frame Bicycle Fit?